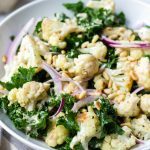 This Roasted Cauliflower and Kale Salad with Lemon Tahini Dressing is the perfect salad for a healthy meal. 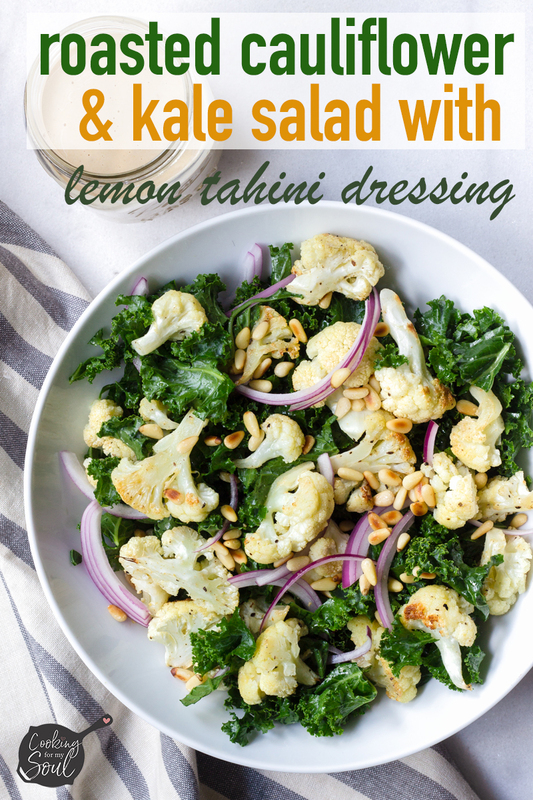 The tangy lemon tahini dressing makes every bite so good! I’m always picky about light salads for a meal. They have to have texture, full flavors, a good dressing, and preferably nuts. 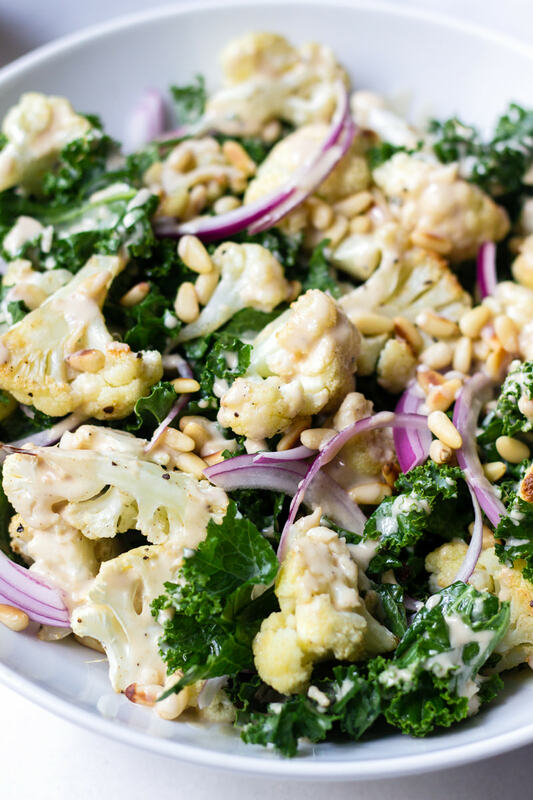 This roasted cauliflower and kale salad is packed with flavor. 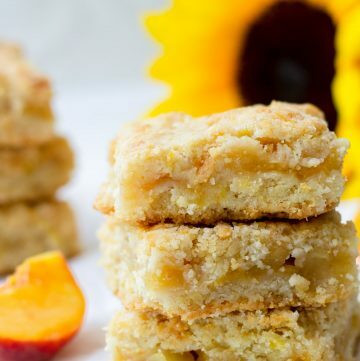 Every bite is so good you’ll want more and more and more! Pretty simple and so addicting! First things first, the star of the dish: roasted cauliflower. 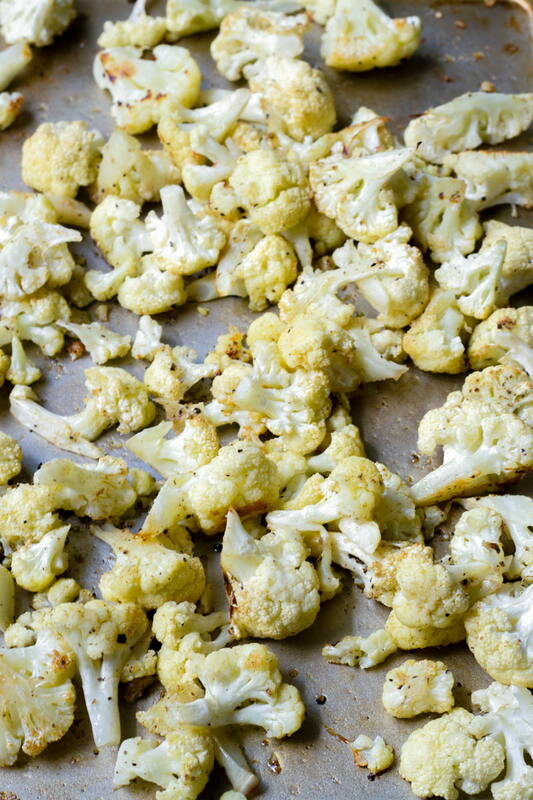 Roasting cauliflower brings out the true flavors of cauliflower. Roast with some olive oil, salt, pepper, cumin, and garlic powder for about 25-30 minutes at 400 degrees F until caramelized and golden brown. Make sure you don’t overcrowd the pan. Also, turn one midway through the cooking process. 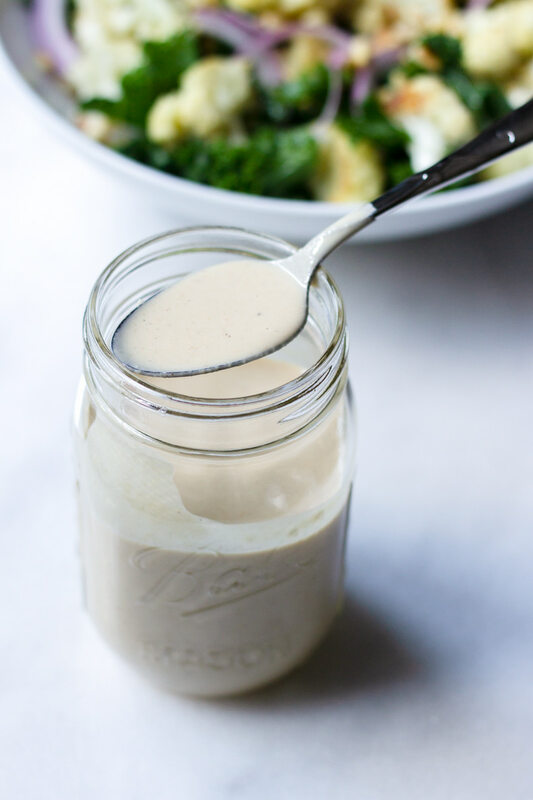 Ohhhh I love anything with tahini, and this lemon tahini dressing is seriously so perfect! Tahini is pretty much a paste made of hulled sesame seeds and is used mainly in Middle Eastern dishes, sweet and savory, and even drinks! 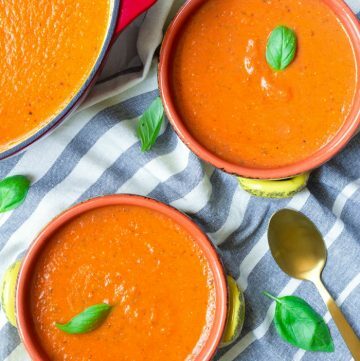 It has a deep nutty flavor, and its creamy texture is optimal for dressings. To make this lemon tahini dressing, you only need tahini, fresh lemon juice, honey, water, salt and pepper. 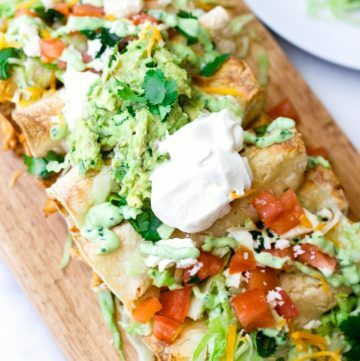 If you’re super hungry, I suggest that you serve this as a side salad. 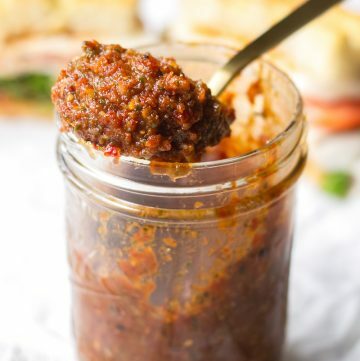 This would be perfect as a side with roasted turkey, grilled chicken breast, or pan-seared tofu. 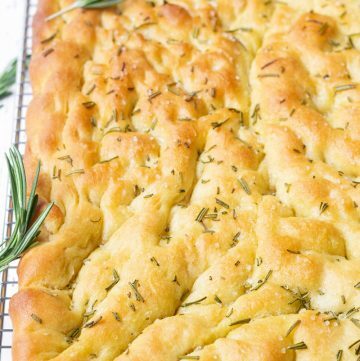 For easy clean-up, line your sheet pan with aluminum foil. Raw kale is has a tough texture. To soften it, place chopped kale in a large bowl, add a generous drizzle of olive oil, a few tablespoons of apple cider vinegar, and a pinch of salt. Then massage it using your hands until desired texture. You’ll notice that the kale will begin to soften and reduce. Toast pine nuts in a small skillet at medium high heat. 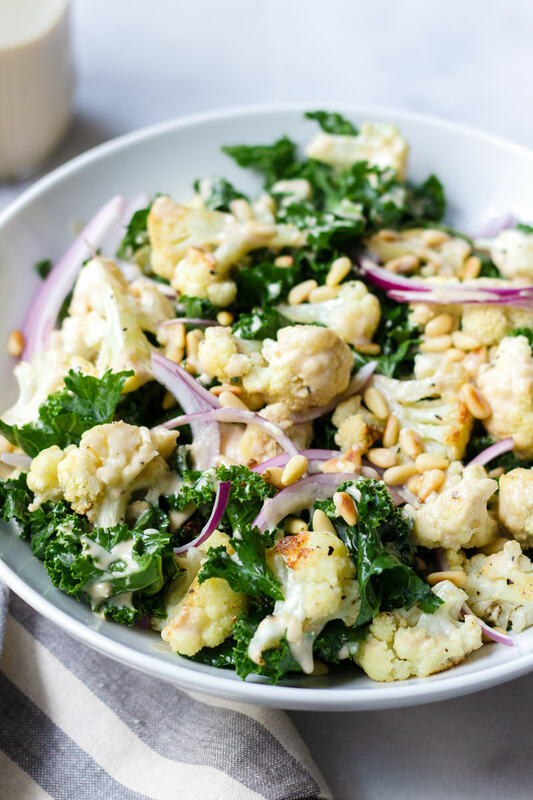 This roasted cauliflower and kale salad is packed with flavor from the roasted seasoned cauliflower and a tangy lemon tahini dressing. In a large bowl, toss chopped kale, 2 tablespoons apple cider vinegar, a generous drizzle of olive oil, and a pinch fo salt. 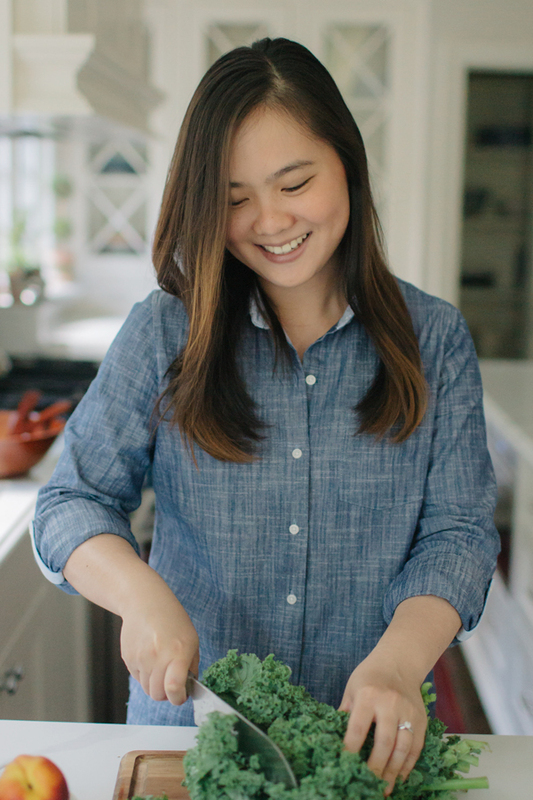 Using your hands, massage the kale for 1 minute, or until desired texture. It will start to soften and reduce. 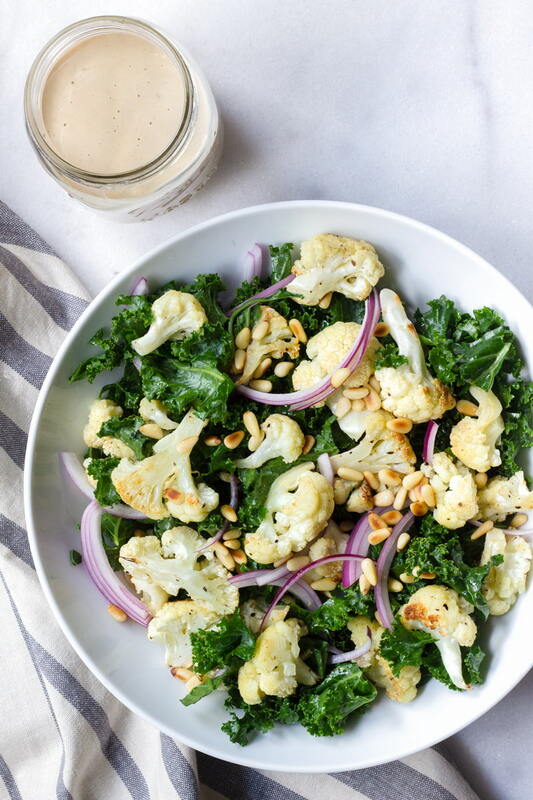 In a large serving bowl, toss prepared kale, roasted cauliflower, toasted pine nuts, and sliced onions. 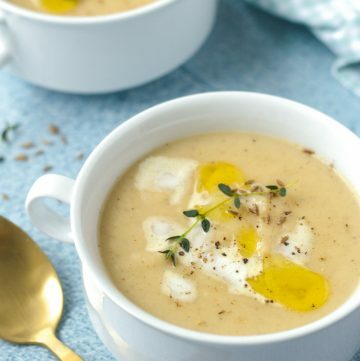 Serve with some lemon tahini dressing to taste. Enjoy!